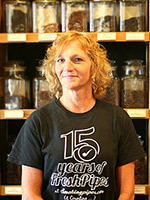 A native of Geneseo of western New York, Cyndy moved down to Georgia following college, working in the restaurant industry for several years before becoming a full-time mom to three (wonderful) children. Later on down the road she would make use of her acquired child-wrangling skills as a school bus driver, then, following that, as a customer service representative. Eventually she decided a change of scenery was in store, and, like so many with a similar urge, she chose South Carolina as her destination. As the SPC Merchandizing Supervisor, Cyndy makes good use of her maternal instincts, but doing a different kind of wrangling: namely, wrangling pipes for our biweekly updates, maintaining the organization of both our Pipe and Site libraries, and supervising our Merchandizing Department.